Is this really Hinault's TDF bike? 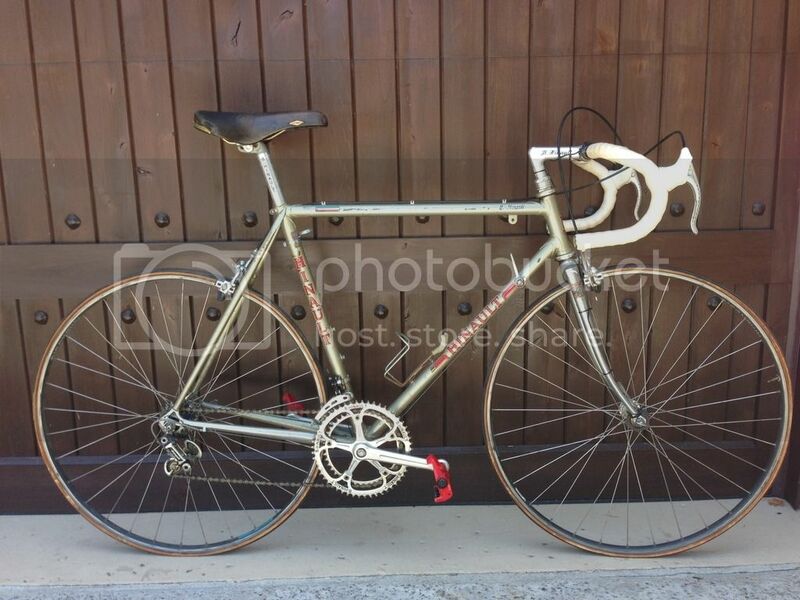 There are so many things about this bike that just aren't right: 1) the brake cables are black (Hinault used grey) and they are routed wrong, 2) Hinault always used handlebars with a shallower drop than these (probably Cinelli 64) wrapped with Benotto tape, 3)Hinault used white LOOK pedals on his '85 TDF bike, 4) the wire held to the right fork blade with zip ties probably for a cyclocomputer - I can't find any pictures that showed Hinault ever used one of these (I doubt doubt he ever cared how fast he was going, just that he was winning), 5) wrong color brake hoods, and finally the color of the frame looks a little off from what he rode in the TDF (which could just be the paint yellowing with age). I'd say if this is in fact (one of) the real Hinault '85 TDF bikes then it's been rejiggered by someone, and not for the better. Anyone care to add to this list? I’m pretty sure Hinault would not have carried a frame pump on his seat tube. I'm inclined to believe it may very well be authentic. I have a copy of Hinault's "Road Racing" (written with Claude Genzling); there are extensive photos of his bike in the book. Many pics of him riding, and a number of shots depicting details in the section where his mechanic, Alain Descroix, explains maintenance. One feature in particular stands out: that large spacer at the top of the headset - identical to the pics in the book. If not, it looks like a good copy. Obviously some components have been changed, but overall??? The components are obscuring what it might be, all there is to really to look at is the frame / fork. 753 transfers, paint looks tired, headset spacer... I would not bid, but it does suggest further referencing. There was a time old race bikes were just old bikes to dispose of at the end of the season. Very few were "special" and retained. It's not for sale, sold some time ago for $15k, as the OP pointed out. I disagree with the OP's assessment of the buyer being a 'poor shlep(sp)'. The buyer obviously had money to spare. I would assume at that price, there is some pretty solid documentation of the provenance. Even with that, I would want everything to be exactly as it was. OTOH, I'm really not in the market for this sort of thing, so what do I know. 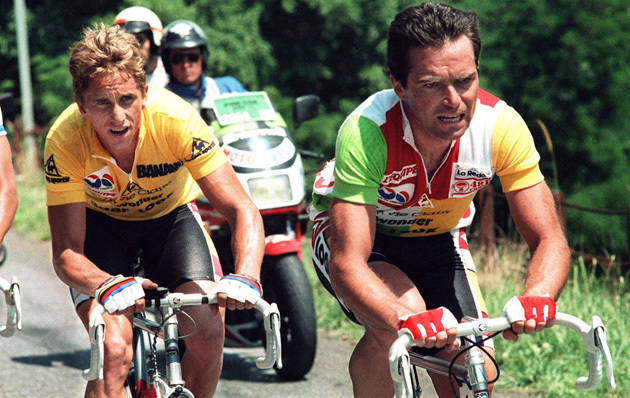 Several details differ in the bikes associated with Hinault's 1985 TDF run. He appeared to use at least two bikes that weren't identical: one with tan or gum hoods, the other white; aero hoods in some photos, not in others; differences in lugs, noticeable on the headset; different decals with the Look label; different rear derailleurs; and what appears to be a Selle Turbo saddle in one photo of him standing to pedal. All photos appear to show Hinault using bars with shallower drops, as the OP noted (although the drops on my own bike looks different from different angles -- when I bought it I assumed it had shallower drops based on the craigslist seller's photos, but it was a trick of the viewing angle). But this depends on the accuracy of the bloggers and articles using the photos. These are just from a few minutes of Googling around for pix of the '85 TDF. Some may be from the '86 TDF. Last edited by canklecat; 10-02-17 at 12:48 AM. Bikes: 1986 SBDU Raleigh, 1984 Raleigh Corsa, 1980 Allin Stan Butler Special, 2 x late 1960s Roberts, 1978 Philbook, 1964 Allin Belgique, 1959 Allin Stan Butler Special, 1951 Higgins Plus Parfait, 1951 Hobbs of Barbican, 1913 Centaur Featherweight. Differentiate images from what is the 1985 TdeF and the 1986 edition, firstly images 1 and 3 show Hinault on the TVT framed machine, note in image 2 (Reynolds tubed machine) the use of a Record seat pin rather than the C-Record version - Pro mechanics BiTD knew the earlier two-bolt pin more reliable - ditto Cobalto as opposed to the Delta brakeset. Also in image 2 the cables aren't under the tape (photos by Graham Watson). Finally the images are from the 1986 edition - I'll leave it to you to work out why...clue, Stage 14. I could say more...but I think you'd lose interest. Last edited by hobbs1951; 10-02-17 at 04:07 AM. The frame itself certainly is the correct size size and has the correct characteristics for one of Hinault's 1985 bicycles. As previously noted, the components are a moot point of reference, as some of these may have been change due to owner preference, assuming he rode the bicycle. Establishing authenticity can be difficult in such cases and there are one method that I would accept - a Certificate of Authenticity from a reliable source (i.e. 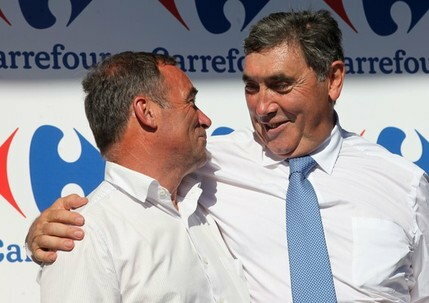 Hinault himself, his team manager or mechanic). A decade or so ago, I would also have accepted a traceable frame stamping. In many cases there are records of frame sales and assignments that can be verified by the manufacturer. Also, in the case of pro teams, the rider's initials are also stamped on the frame. Such cases would increase my level of confidence but not necessarily make it absolute. The C&V market has increased to point where it is starting to attract some unscrupulous people. ...note in image 2 (Reynolds tubed machine) the use of a Record seat pin rather than the C-Record version - Pro mechanics BiTD knew the earlier two-bolt pin more reliable - ditto Cobalto as opposed to the Delta brakeset. Another concession to mechanic preference was the use of a clamp-on front derailleur, though that may have been influenced by the thin 753 seat tube. I've always used the rider's shorts as the most prominent clue in determining if the photo is from 1986, as the 1986 issue carried the Mondian inspired coloured panels. Many would point to the Look branded frames but the Hinault brand can be found in some early season photos. Last edited by T-Mar; 10-02-17 at 06:30 AM. I've always used the rider's shorts as the most prominent clue in determining if the photo is from 1986, as the 1986 issue carried the Mondian inspired coloured panels. Firstly not all Hinault's Reynolds framed bicycles were 753, correct the La Vie Claire livery was Mondrian inspired - I attended both 1985 and 1986 TdeFs so am familiar with the details (team, team members and bicycles). Zombie thread resurrection. Hinault rode custom frames in 85 with a really slack seat angle for a frame that size. Something like 72 degrees, when normally a bike his size would be 73.5 or 74. You could probably measure the seat tube angle on the pic shown . In my opinion, the frame may be original. But the fork does not. He used another kind of fork crown to this type frame. Replacing the fork can explain the many spacers. Do not mix the aluminum frames, what he used on the mountain stages in this story! Last edited by Old Fireleg; 07-10-18 at 07:57 AM. Aluminum?... isn't that a CF TVT frame he is riding on those posted pics.... just painted over...?? I love a good old Hinault zombie thread. LOL, Hinault. He's the Chuck Norris of cycling. He may be an a$$hole at times (like just before this year's TdF), but he's the superhero we deserve. 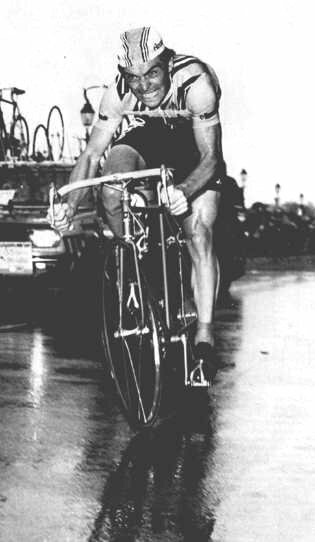 And the TdF was so much more enjoyable to watch in his time... when the winners were actually trying to win stages as well as the entire tour. I just read that Mark Cavendish has more stage wins than Hinault and is only four behind Merckx; Chris Froome isn't even in the top 25. There's some great info about Hinault and the frames bearing his name on the GitaneUSA.com website. You'll have to do some searching. 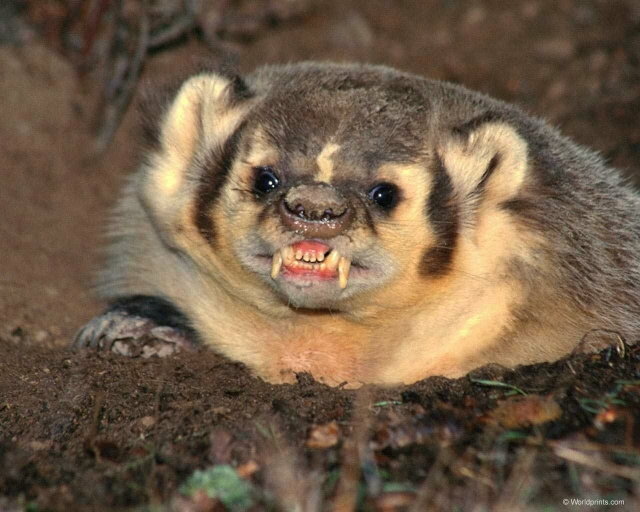 Ne plaisante pas avec le blaireau Don't mess with the Badger! 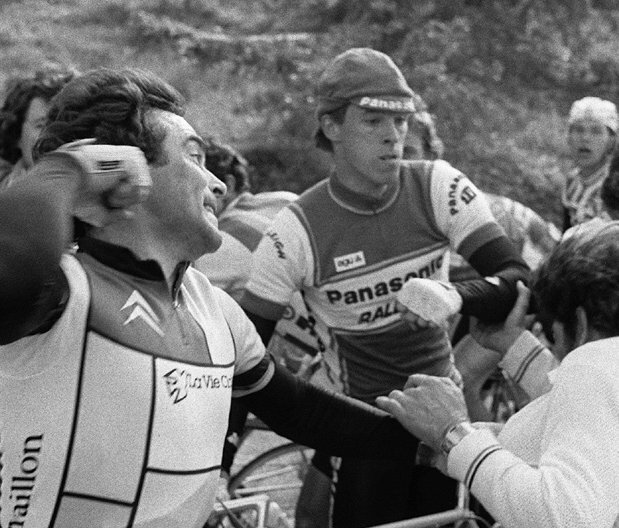 Hinault was nothing if not INTENSE! I think the Panasonic Raleigh rider in the back was American Andy Hampsten??? As an aside according to Hinault and Lemond, all of the steel frames used by the Gitane teams during the early 80's glory days where produced in house by Gitane. 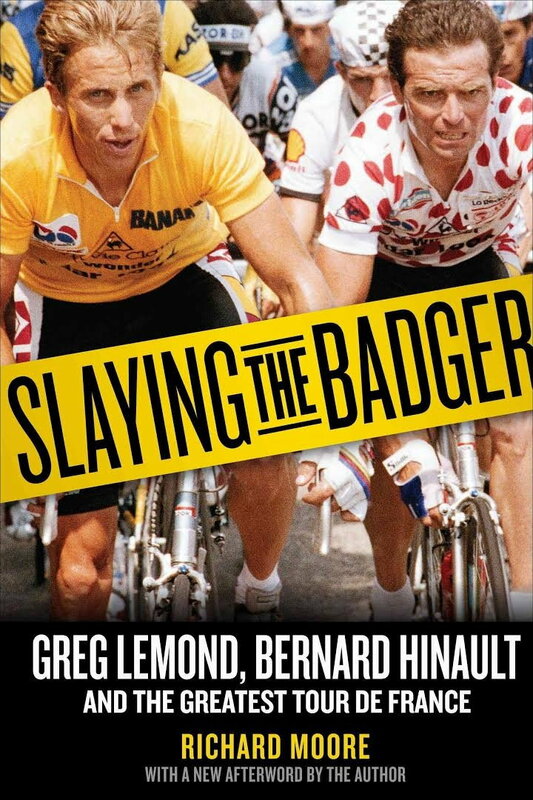 Lemond's book "Slaying The Badger" has a lot of insights on Hinault and the Gitane teams. Last edited by verktyg; 07-11-18 at 12:44 AM. The Panasonic Raleigh rider in the back is Phil Anderson. 84 Gitane Tour de France. 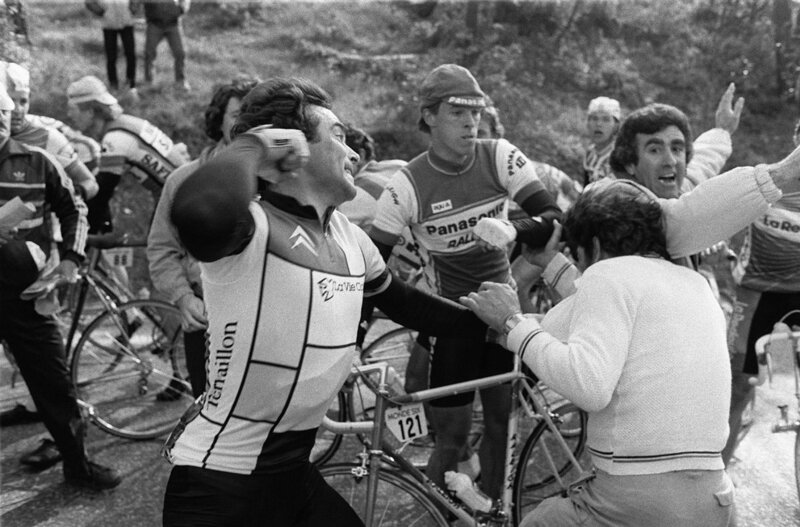 I always like Hinault, he's a fighter. But good thing he didn't get paid to punch, cause he "caint" [sic]. Yes, that overhand style punch he's doing on that pic seems a bit odd..... Heck!, I think that's how my older sister used to punch me when we were kids!